To close the gap between the M40/25 and the ARRIMAX 18/12, the M90 introduces a new power class of 9000 W. The unit is open-faced and very bright; it is also focusable from 16° up to 49°, producing a remarkably even light field and a crisp, clear shadow. ARRI technology partner Osram developed a new 9,000 W lamp for the M90, which is stable at 1,000 Hz and almost as small as the 6,000 W lamp that can alternatively be used. This allowed ARRI to design the M90 in a very compact housing, barely larger than the ARRISUN 60. Accompanying the M90 is a new ballast, the EB 6/9 kW, available in standard and high speed versions. Like other recent ballasts from ARRI, it features CCL (Compensation for Cable Loss) technology and the power-saving ALF (Active Line Filter). 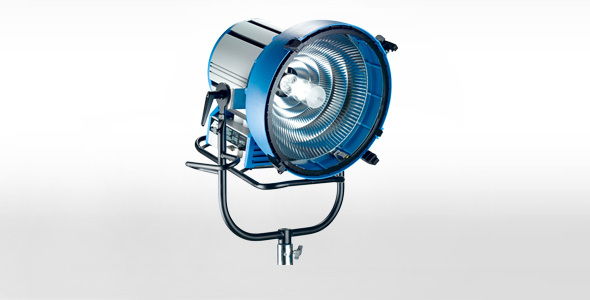 The EB 6/9 kW is DMX compatible and no bigger than ARRI’s existing EB 6000 Baby ballast.